Tuesday nights are about to get reeeal dangerous. Or so, a little birdy told me. Death & Co., which recently rejoiced over its extended hours (now open until 2 a.m. on weekends), rolled out a new cocktail and food menu earlier this week, and I had the pleasure of attending last night’s press tasting. The 2 1/2-year-old cocktail den of East 6th Street had a challenging beginning with several legal battles with the SLA/Community Board 3, but this new, inspired menu signals perseverance for the bar and seems to put the past to bed. Co-owner David Kaplan is especially proud of the new food menu by recently-hired Chef Luis Gonzalez, who trained under renowned chef Jean-Georges Vongerichten at Mercer Kitchen. “For once, I feel like we have a food menu that is on par with the quality of the cocktails,” said Kaplan. And quality cocktails they are–we started with “Pelée’s Blood” (Rhum JM Blanc, Don’s Mix #2, homemade grenadine, lime juice, dash absinthe), D&C bartender Thomas Waugh’s take on a tiki cocktail. 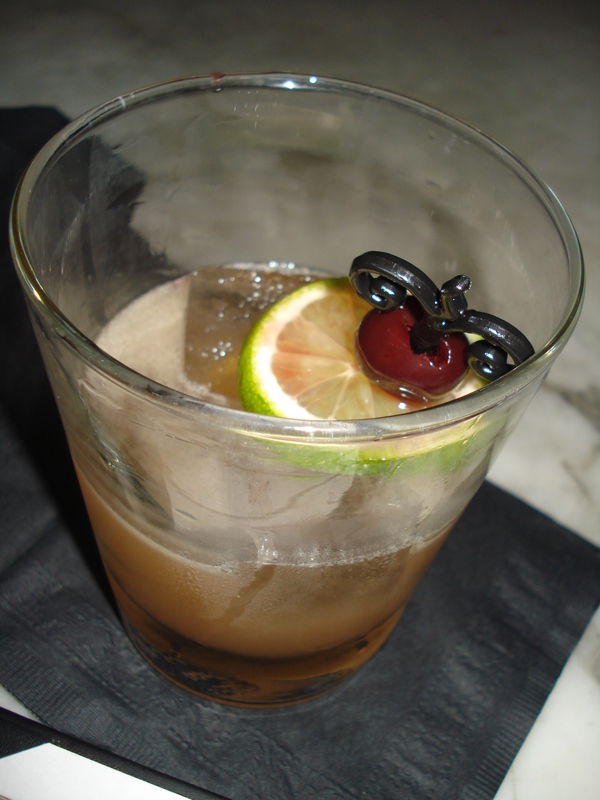 It was a delicious punch-type drink with balanced sweetness, and it made for a refreshing start. The drink was paired with a small plate of tuna tartare with crushed avocado and homemade kettle chips as well as a melt-in-your-mouth pan-seared foie gras with corn pancake and quince puree. Clearly, Gonzalez’s dishes elevate bar snacking to a whole new level. Next, I had the “Daisy Buchanan” (Chamomile-infused Old Overholt Rye, Dolin Dry Vermouth, Aperol, and Yellow Chartreuse), created by D&C bartender Joaquin Simo. Solid, strong cocktail, especially if you like a dry finish. This was a perfect palate-cleanser for the pulled-pork slider and mini-scoop of truffle mac ‘n’ cheese, which were both highly-satisfying indulgent treats. Then, onto the “Ingenue” (Pierre Ferrand Ambre Cognac, Dolin Sweet Vermouth, Don’s Spices), one of D&C bartender Brian Miller’s cocktails. The clove-heavy flavors of Don’s Spices (a mix of vanilla syrup and allspice dram), made for a rich, autumnal drink that would be perfect for sipping next to a fireplace. This was paired with a mushroom tart with walnut and onion pesto and the crispy pork belly, served with sauteed kale, braised cranberry beans, and pomegranate seeds. Last but not least was D&C bartender Alex Day’s “Little Engine” (Famous Grouse whisky, tawny port, apple butter, lemon juice, maple syrup). Served over a mountain of crushed ice with a fresh apple garnish, this drink for me was the most “adult” apple cocktail I’ve ever tried. The port adds depth to the usual apple pie flavors, and the apple butter infusion coats the tongue without being unctuous. Naturally, this was served with apple cobbler. Special thanks to David for the invite, and to bartenders Jason Littrell and Brian Miller for being so on-point, given all of those new recipes to keep track of. I can’t wait to return and try more! Tuna tartare with homemade chips and pan-seared foie gras with corn cake. Pulled-pork slider, truffle mac, and the Daisy Buchanan. 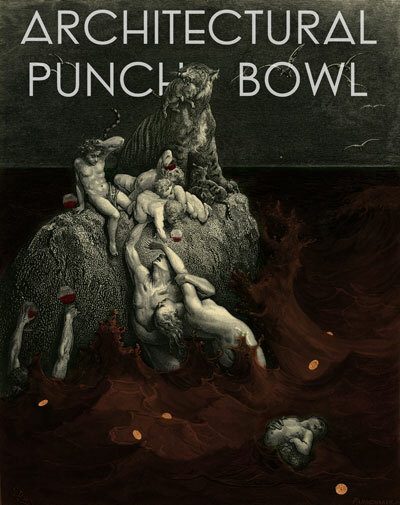 The Architectural Punch Bowl, big enough to row in, comes to London next month. Those Londoners know what’s up–next month, look for a giant punch bowl big enough to paddle a boat in at 33 Portland Place. The winning punch recipe will soon be announced by artists Bompas & Parr, collaborating with Courvoisier. More good news for LA’s cocktail scene–which is yet to be “fetishized,” according to Audrey Saunders, who will help open The Tar Pit there on Dec. 7. Feeling a November chill? Warm up by checking out AMountainofCrushedIce’s best-of tiki drinks from the days of Don the Beachcomber. 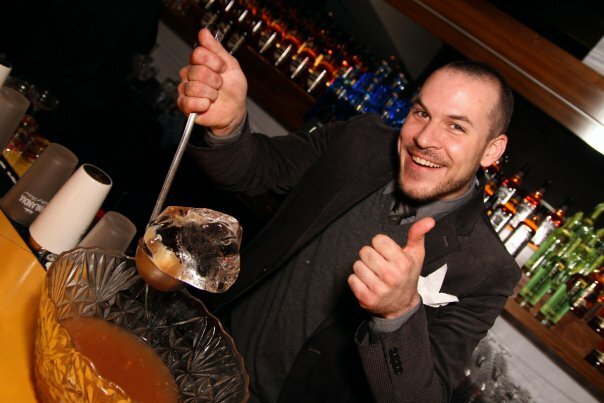 Apple brandy is the apple of the bartender’s eye these days, according to the SF Chronicle. Rickhouse’s “Scottish Breakfast” with Germain-Robin Apple Brandy and Glenrothes Select Reserve sounds like a winner!